We’ve teamed up with natural skincare experts Boscia to bring you the ultimate in naturally glowing skin! Plus enter for your chance to win! The key to a gorgeous, even tan that lasts? Exfoliate, exfoliate, exfoliate! Boscia Exfoliating Peel Gel is the perfect way to prep your face before tanning, the peel gel acts as a physical peel to remove the outer layer of dead skin, a chemical peel for in-depth exfoliation and a treatment to firm and and brighten for a healthy complexion! Simply apply to clean, dry skin and massage onto your face in a circular motion and rinse with clean water. Your skin will appear smoother, softer and brighter after a single use! Repeat exfoliation on your body using our Superfine Skin Polish and you’ll have the perfect base to apply your face & body tan! Get your bronze on with our cult tan, pHenomenal 2-3 Week Mousse. Odorless and non-toxic, the innovative formula is enriched with an infusion of botanicals to deliver a luminous, natural color. Our Flash Dry technology means your skin will be instantly dry after application – It’s the easiest daily glow! Apply the Mousse in circular motions all over the face & body using a Tanning Mitt. Rinse your skin 8 hours later for a gorgeous, lasting tan. Maintain your glow with our Fabulous Self Tanning Gradual Lotion, the super hydrating formula will leave your skin glowing with a golden tan. It’s your daily glow skin saviour! Massage the odorless(!) lotion onto your face and body in circular motions, your tan will develop 4-8 hours later! 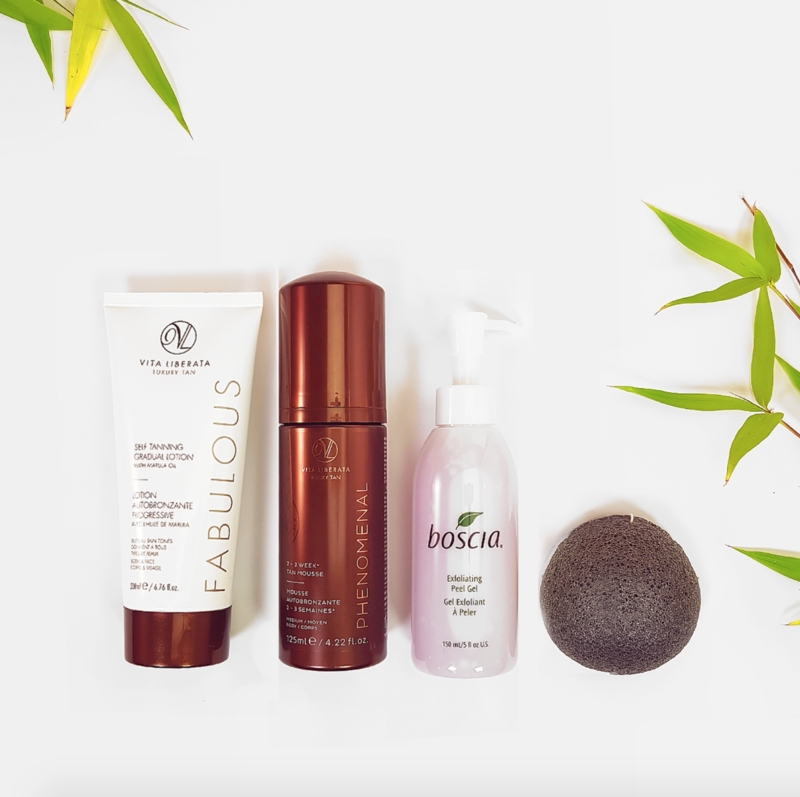 How would you like to WIN a Boscia Exfoliating Peel Gel, Boscia Konjac Cleansing Sponge, pHenomenal 2-3 Week Tan Mousse & Fabulous Gradual Self Tan…?! Find out how you can win with Boscia and Vita Liberata here!